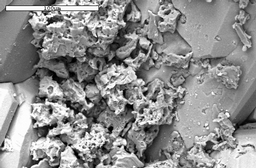 SEM image (7500x) of Ghostown white punk rock, Lechuguilla Cave. Note the very tiny star-like objects coating the dolomite substrate. Samples are Au-Pd coated. Photo by Spilde and Northup. 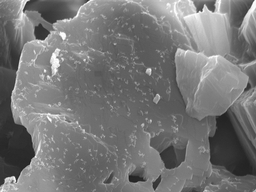 Closeup SEM image (30,000x) of previous photomigrgraph of Ghostown white punk rock. 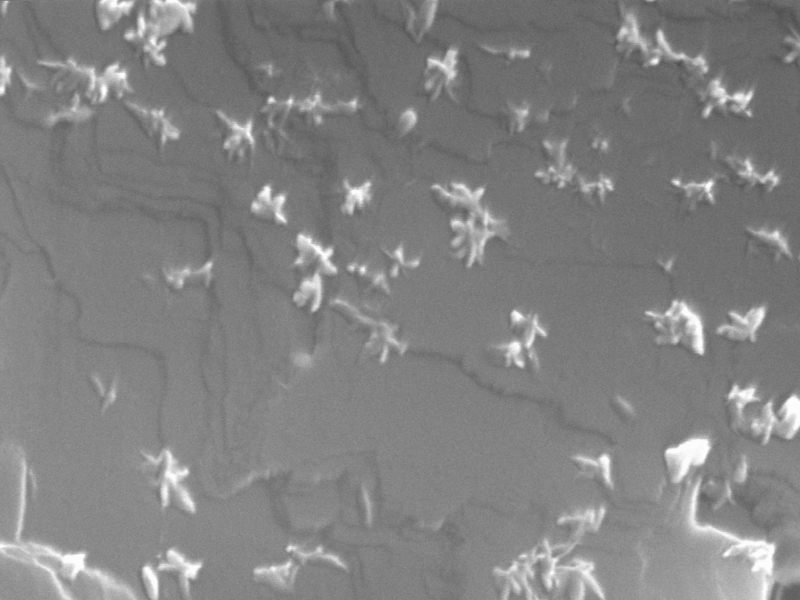 Note the very tiny star-like objects on dolomite substrate. Samples are Au-Pd coated. Photo by Spilde and Northup. EDS spectrum of tiny star-like objects. No iron is present in the analysis. Samples are Au-Pd coated. Analysis by Spilde and Northup. EDS spectrum of background between star-like objects in the Ghostown white punk rock. Samples are Au-Pd coated. Analysis by Spilde and Northup. 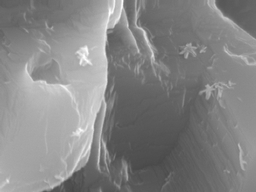 Closeup SEM image (27,000x) of Ghostown white punk rock. 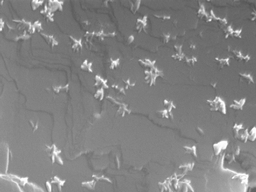 Note the very tiny star-like objects on dolomite substrate. Samples are Au-Pd coated. Photo by Spilde and Northup. SEM image of dolomite from gypsum sample from EY56 in the Western Borehole. Photo by Spilde, Northup, and Boston. 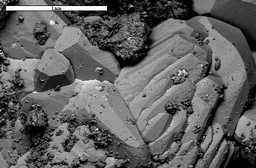 SEM image of dolomite in the outer wall rock sample from EY56 site in the Western Borehole. Photo by Spilde, Northup, and Boston. 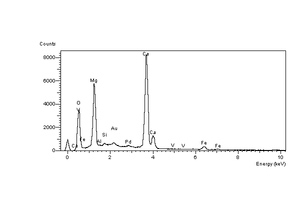 EDS spectrum of the area between the larger dolomite crystals in the outer wall rock sample from EY56 site in the Western Borehole. A strong iron signal is observed. Not shown, but detected in the surrounding areas are barite crystals and gypsum particles. Samples are Au-Pd coated. Analysis by Spilde, Northup, and Boston.